Thanks to Steve Schubert for taking a bunch of photos of the 12th Annual Open House event. If you have photos from the weekend you'd like to share, please email them to himountainlookout@gmail.com! Open House will still be this Saturday! There are some issues impacting the open house event this Saturday because of the government shutdown and our event almost got cancelled, but we are still on!! Hi Mountain Campground is closed to all public access and no camping allowed, so all camping this Saturday night will be at 'Cypress Hill' by the lookout. No campfire permits can be purchased so that means that not even backpacking or camping stoves will be allowed for use, but folks are encouraged to heat their food using the gas stove inside the lookout. No smoking. Fire danger will be severe, with warm temp. and offshore winds predicted. We must lock up the lookout/gates and vacate fairly early Sunday morning. The gate before the campground is being kept open for our event, but will get locked after we are out. We will need some volunteer help from those camping out with locking things up. Please help out with forwarding this information to your friends, colleagues and guests to help get the word out. Thanks!! See you there! 12th Annual Open House 2013 Event Schedule! Note: The open house event at Hi Mountain Lookout formally begins at 12:30pm, with introductions, condor program updates, lookout tours, guided field trips, potluck dinner, evening program presentations, star gazing, and an optional overnight campout. Visitors will find parking available close to the lookout throughout the day. 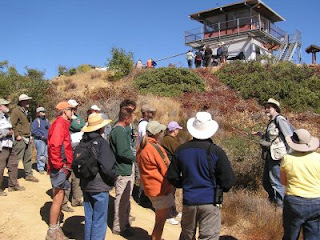 Meet 9am at Pozo Ranger Station. Field trip participants are encouraged to arrange car pooling from Pozo. Car stops along Hi Mountain Rd. – short, easy hiking conditions. Note: no campfires are permitted for cooking or the overnight campout. Popcorn and refreshments will be served! Camping sites are available Saturday night at ‘Cypress Hill’ near the lookout. Other vehicle camping sites are located on the ridgeline near the entrance gate on Hi Mountain Rd., with a view overlooking the mountains and coast, and also at the USFS Hi Mountain Campground located one mile down the road from the lookout. There are picnic tables and outhouses at the campground. Bring your own potable water. Our point count data collection went smoothly; poison-oak proved to be the greatest hurdle as we climbed and crawled through it all summer to find our GPS coordinates. We saw some amazing birds this summer. Our most commonly recorded species were Mourning Doves, Acorn Woodpeckers, and Wrentits to name a few. 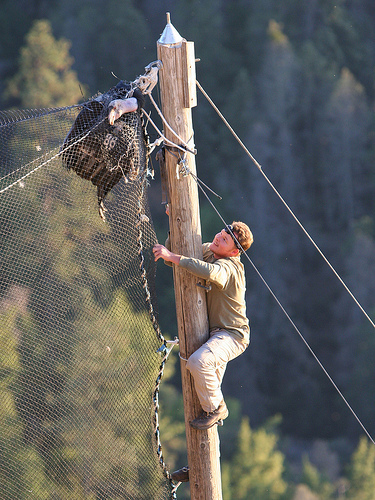 We all had our favorite birds picked out when our bird data collection came to an end. Then it was on to vegetation data collection. It was not as enthralling as the bird data collection but we got very familiar with the common native (and non-native) plants in the area. We hiked back to each GPS location and recorded information on the plants that existed 25 meters in four directions from the GPS location center, North, East, South, and West. This data allows us to understand the vegetation composition of each area where birds are detected. This valuable data will be used by the US Forest Service and by students at Cal Poly for senior and independent projects concerning which species occur in which habitat/ vegetation types. telemetry receiver towards the Pinnacles National Monument which was exciting! With the fire danger in the area reported as "extreme", we also reported a couple fires! We worked hard through the summer heat and recently completed our work at the lookout, setting a record for the fastest intern group to finish the necessary data collection. We had so much fun working up at Hi Mountain this summer and are looking forward to more visits, especially the open house! We hope to see some or, even better, all of you there! On May 19, 2012, a memorial gathering was held at the Hi Mt. Lookout to celebrate the life and work of our dear friend Mike Tyner. A number of Mike's family members were in attendance that day, and Hi Mt. volunteer John Fitzrandolph sat down with Mike's brother Tim Skeens to ask him a few questions about Mike's life. John recently found the recording he made of the interview, and thought it might be something Mike's friends would enjoy hearing. Mike's family has given their blessing to share it with the world via this website. Tim has a great speaking voice, and he shares some wonderful and poignant insights. We hope that Mike's story will continue to inspire and uplift both those who knew him, and those that have only heard of him. Thanks to Tim Skeens, Nancy Tyner, and John Fitzrandolph for making it possible to share this interview. Or, you can download the interview as an mp3 podcast (13mb) from this link.